Mike Davis was on his way out, but this one was quite sweet even as the program looked to restructure, blissfully unaware of what the future what hold only a ahort three years later after a disastrous hire. Nevertheless, after being outplayed for much of the game and trailing 83-82 with 40 seconds to go, Marshall Stickland made a great defensive play that resulted in an over-and-back call on the Aztecs. After the timeout, Robert Vaden drained a three to give the Hoosiers an 85-83 lead that they would not relinquish. Although they would go on to lose to Gonzaga two nights later, this win felt fantastic coming off of two consecutive tourney absences, the first time that had happened since the last championship. We would get our revenge on Gonzaga in the first round the following year, but it would be a painful five year wait until the next tournament win. This was, for the most part, a wild, frustrating game against a tough defensive squad in VCU that created a season high 22 turnovers and led this game by 9 points on two separate occassions. Thanks to the tempo of the game going against the Hoosiers’ preferences, such a deficit seemed almost insurmountable. However, on the first occassion, near the end of the half, Christian Watford was able to rattle off two three pointers and convert on an and-one to bring us back, and later in the game, we were able to hang around just close enough. Trailing by 3 with under a minute and with VCU at the line, Victor Oladipo, in a moment that would foreshadow what was to come the following season, grabbed the rebound and went coast to coast, and converted on a tying three point play. VCU ran the shot clock down on the next possession but solid IU defense forced a contested three, which Oladipo again grabbed, pushed back up the floor and passed (or had his shot blocked, but whatever) to Will Sheehey, who spotted up and drained an easy 12 foot jumper with just under 13 seconds to play. VCU had an open look for the win, but another three point miss was hauled in by the Hoosiers, who were off to their first Sweet 16 in ten years, and were officially, once and for all, back. This was the defining moment of Mike Davis’ first full year at the helm, as the Hoosiers knocked off the #1 ranked Michigan State Spartans. It was the first #1 ranked team Indiana had beaten since 1993 when they knocked off the hated Kentucky Wildcats. However, this game provided a brief sigh of relief for fans still enraged by Bob Knight’s firing. Trailing by two with the ball, Davis drew up a play to go for the win rather than send the game into overtime at home, a plan that could have easily backfired. Instead, junior Kirk Haston knocked down a three pointer at the buzzer and bedlam ensued as fans stormed the court. Probably the most memorable aspect of this moment, however, was Davis’ reaction, as he dropped to his knees in a combination of relief, disbelief, and probably thankful prayer. It is easy to forget what a great player Jay Edwards was in his brief time with the Hoosiers, but this was the defining moment of his career. Trailing by two against a Michigan team that would go on to win the National Championship that year, Edwards just barely beat the clock on a three pointer that was nothing but net, and Indiana walked away with a huge victory. This might be the only victory where Coach Knight showed so much genuine emotion at the moment the shot went in; it was a rare occasion indeed to see the General jumping up and down after a win. 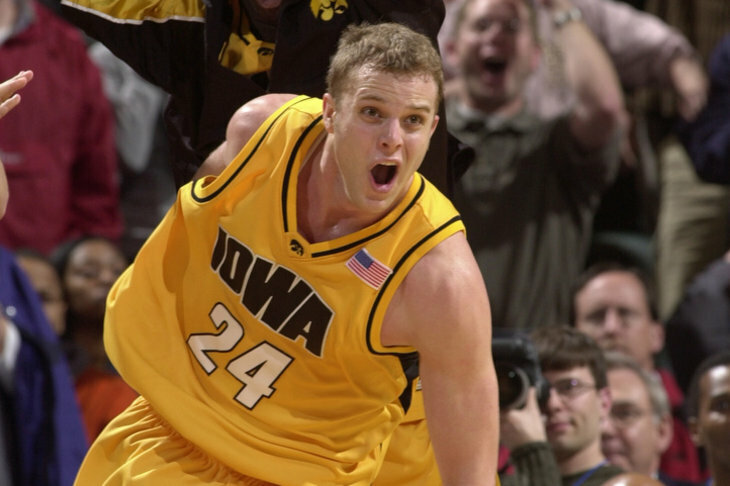 When I met Edwards a few years back at a bar in the South Loop, I immediately mentioned that this game was one of the high points of my entire childhood, and told him how upset I was when he decided to leave after his sophomore season. He admitted that he regretted that decision, and had nothing but good things to say about Knight. Any time you beat Kentucky, it’s a big deal, but this time it was in the tournament, and it was a bigger deal. The hard fought win advanced the Hoosiers to the Sweet 16 for the third time in five seasons under coach Tom Crean, and provided some revenge against the rival that put them out of the 2013 tournament in route to their own national title. It was a fitting final win for legendary point guard Yogi Ferrell, who would graduate with two big ten championships and two Sweet 16 appearances. My reaction after this win, several beers deep, could best de described as profanely taunting the television screen and Kentucky players before falling backwards into a table of unsuspecting bar-goers. There were no last second shot heroics necessary here, as the Hoosiers advanced behind a thoroughly solid performance from a team led by its senior point guard before falling to eventual national runner-up North Carolina the following weekend. Does everyone remember how overmatched Indiana was coming into this game? I can’t think of a single analyst that picked them, and for good reason; Oklahoma was many people’s choice to win it all, and Indiana was coming in as a big underdog and seeded #5 in the South Regional. But those of us who believed knew that the Hoosiers had one last miracle left in them during their furious charge to the championship game in 2002. Worthy of note is the fact that Indiana actually trailed by four at the half, but went 8-13 from three point land on the game, a statistic that was key to their success throughout their tournament run. Over a decade later, it is still tough to believe we were heading to the National Championship for the sixth time in history following this unlikely upset. I found myself laying on top of a stranger’s car screaming “We’re in the Final Game!” and I don’t think they were even upset by it. Bob Knight didn’t know it at the time, but after winning this game, he would make his last trip to the Final Four. Only five years removed from a championship, this was still an incredibly difficult game for a young but talented Indiana team that was just hitting its stride. UCLA had easily beaten the Hoosiers in the preseason, but IU turned the tables this time, and blasted the Bruins 106-79 after putting up a whopping 62 points in the second half. I was in Orlando, Florida with my family visiting Disney World, and I couldn’t ever remember having more fun watching an IU game at any point in my life up to that point. The combination of the significance of the game, the decisiveness of the win, and the fact that I didn’t expect a win in the first place make this game one of the most memorable. It is worthy to note that in November of the same season, the Bruins crushed the Hoosiers, which made turning the tables in such decisive fashion with a trip to the Final Four on the line even more sweet. It was a very tough call to put this victory ahead of tournament wins that put us in the National Championship and Final Four respectively, but the circumstances of this game and the amount of years it had taken to realize what this win accomplished (20) places it higher on this list simply because of the two decade drought it watered. In 1992, Indiana had been to the Final Four just five years earlier, and the trip to the Final Game in 2002 broke a 15 year drought. But this improbable, heart-stopping win over Michigan clinched the Big Ten regular season title outright for the first time in 20 years, and was the ultimate coronation for a group of players and coaches that had been through hell and literally went from the bottom to the top in what was arguably the strongest edition of the Big Ten conference in its storied history. Trailing by five points with under a minute left, the Hoosiers took advantage of two front end misses at the line by the Wolverines, and played smart, efficient offense. Cody Zeller scored the final six points for the one point win as the team efficiently exploited the mismatch down low in the final minute. Zeller also hit two crucial free throws before hitting the shot that would be the eventual game winner. To add to the drama, Michigan had two very legitimate shots to win game, trailing by one with under ten seconds to play. All-American point guard Trey Burke’s runner missed long, but Jordan Morgan’s tip in rolled in and around the rim for what seemed like an eternity before sweet gravity finally overcame it and Christian Watford came up with the game-saving rebound. I haven’t reacted to a win this wildly, well, maybe ever. As the years pass, it will probably be forgotten that these Hoosiers had the chance to clinch the outright conference title on their home court on senior night against an Ohio State team they had beaten handily in Columbus just three weeks earlier. Indiana lost that game, but cut the nets down anyway. And it was only fitting that a group that stuck together and endured such misery in its first few years together would have to earn this the hard way on the road in Ann Arbor in the most unlikely fashion conceivable. In terms of pure shock value, this should probably be number one. Coming off a ten win season, the unranked and overlooked Hoosiers battled the top-ranked and eventual National Champion Kentucky Wildcats in Assembly Hall. Behind a raucous, rejuvinated home crowd, the Hoosiers built a ten point lead midway through the second half behind hot shooting, smart passing and solid defense. Outmatched from a talent perspective, Indiana would give away that double digit lead late as they failed to get stops down the stretch and the offense turned cold. After hitting two free throws, Kentucky held a two point lead with under ten seconds to play, and had fouls to give. In a mental lapse, they failed to get that foul to stop the clock, and Verdell Jones split the defense before unselfishly dishing the ball to a trailing Christian Watford, who knocked down a three pointer at the buzzer for the win. Bedlam ensued on the court, and Indiana was officially back. We would lose a hard fought offensive onslaught to this same rival in the Sweet 16 round of the tournament three months later, but there is no way to measure the impact that this win had on the program. It was a preseason game that should have had no real bearing on the future trajectory of the team, but instead, it instilled a confidence and left a legacy that will likely never be forgotten. The Hoosiers would go on to knock off another top ranked team at home in the weeks that followed, and carried its momentum into the tournament for its first Sweet 16 appearance in a decade. This was the game that I will always remember most of any game I have ever seen Indiana play. The win here catapulted the Hoosiers into the Elite Eight for the first time since 1993 in stunning fashion over the #1 team in the country. At the time, we were all happy just be back in the Sweet Sixteen, and didn’t hold much hope for a win, especially after falling behind 26-8 early. But what made this game so special was the way that we came back; slowly but surely, we chipped away at the lead with threes and smart inside play, and all of a sudden, we were only down by one point with five minutes to play, and then it hit me- we could actually steal this game! The very thought was almost too much to bear, but inched closer to reality when Tom Coverdale hit a layup to take a 72-70 lead with under a minute to play. It was almost happening too quickly to comprehend, but there it was, clear as day- if Duke didn’t score again, Indiana would win the game in an astonishing comeback. But I’d watched way too many IU games over the years to come anywhere near celebration mode quite yet, so instead I braced for the final seconds, which passed like an eternity. The drama was at full throttle. After we got a huge defensive stop, a near over-and-back on the inbounds saved by Dane Fife resulted in a fortunate foul call on Duke. A.J. Moye knocked down two free throws, and with 11 seconds to play, IU led 74-70. Now, the celebration could begin, right? Not so fast. Any other coach would have essentially pulled his team off the court at this point, but not Davis- the team played defense way too aggressively after failing to retrieve the offensive rebound on Duke’s first missed three and fouled the nation’s best player, Jason Williams, as he drained a three with 4 seconds remaining. Williams, a 90% free throw shooter, needed only to make one free throw to send the game into overtime, which to me would have meant almost certain defeat for the Hoosiers. I was absolutely beside myself, sick to my stomach, but what happened next was nearly an even worse scenario. Somehow, Williams missed the free throw, but in a horrific development, Carlos Boozer out-rebounded Jared Jeffries and threw up a desperation shot that was well within the realm of his accuracy. Now instead of overtime, we were looking at losing the game outright in regulation!! The time that it took for the ball to leave Boozer’s hand until it banked out of the hoop must have taken a year, and Jeff Newton pulled down the rebound as time expired. Then, bedlam set in, as we realized that it was actually, finally, over, and the first of many celebrations on Kirkwood Avenue that spring was the most memorable moment of my senior year, and of the last 25 Indiana seasons. Ironically, it is the same score that gave Indiana their last national title in 1987 over Syracuse in an equally enthralling finish. In the grand scheme of things, this loss was meaningless. The Hoosiers were looking at an NIT berth at best without winning the Big Ten tournament, which was a highly unlikely proposition. But for this to happen on senior night, in double overtime, in a game where the suddenly scrappy Hoosiers had played so well, it was a real heartbreaker. Both overtimes were back and forth affairs that featured several lead changes. Indiana found itself with the ball, trailing by one with 15 seconds remaining. A smartly designed play featured leading scorer Juwan Morgan backing down to towards the hoop for an easy layup to take the lead. They left 7 seconds on the clock though, which was enough for C.J. Jackson to knock down a game-winning three from beyond NBA range. In a season where Indiana had held late second half leads against top ten teams like Duke, Purdue and Michigan State, this was just yet another instance where they came up just short. They missed a LOT of free throws (ten), too, which always hurts in double overtime. Admittedly, at the time, this loss seemed to be more brutal than it actually was. In fact, one could argue the utterly brutal specifics of this loss lit a fire under this team that would lead to successive road wins against much tougher teams in Michigan State, Ohio State and Michigan. The team was on its way to a #1 seed in the NCAA tournament and an outright Big Ten Championship despite the outcome here. But with the bitterness of the rivalry between these two schools still fresh despite Bruce Weber’s departure, this was an incredibly tough pill to swallow for die-hard fans. I for one didn’t sleep for at least a couple of days. While everyone wanted to talk about how utterly horrendous our defense was on the last play, that has never been a sticking point with me. We were going to get destroyed in overtime anyway with the way the momentum was shifting. But to control an entire game by double digits, and then to play as though we were trailing while up ten, throwing up quick, ill-advised shots and giving up easy jump shots on the other end, was particularly stomach-churning. The fact of the matter is, no one should have been talking about the last shot, because the last shot should have never happened. Indiana had the ball with the shot clock turned off and a tie game. That should mean overtime in a worst case scenario. Instead, Victor Oladipo, in perhaps the only mistake he would make in his entire junior season, saw a lane and tried to go behind his back to get there, only to be picked by D.J. Richardson. To his credit, Oladipo made a tremendous play to get back after the steal and make what should have been a game saving block. Then, with under a second left, the above happened. In all honesty, this loss didn’t devastate me as much as it should have, because I had a feeling that my beloved Hoosiers were about to be exposed. But it was obviously a sad feeling when the ride of the 2002 tourney ended with a loss one game short of a championship. They just didn’t have enough depth to knock off another superior opponent once the threes stopped falling. However, this was the first time Indiana had ever lost in a title game in six tries, and it has to make the list just due to the sheer magnitude of the game. Also, we did have the ball when game was tied with just under ten minutes to play, so we had a real chance to pull the upset in this one. What made this game even worse than the outcome would suggest is that this was also the day that the Kelvin Sampson allegations hit. Indiana was coming off huge back-to-back wins over Michigan State and Purdue, and would be in control of the Big Ten with a victory. The game was tightly contested all the way through, with over a dozen lead changes. Sampson was still at the helm at this point, and the Hoosiers clung to a 66-65 lead with ten seconds left, Wisconsin ball. It seemed that the call would be to go inside for an easy two, but instead, Brian Butch, the only polar bear that I have ever disliked, threw up a deep three-pointer that somehow banked into the hoop. Indiana had a chance to go back ahead, but a hurried three rimmed out, and deflation set in. One could argue that it was the single turning point for that promising season, the moment when the music stopped on one of the most talented teams to ever put on the Candy Stripes. In 1989, the Big Ten boasted three of the nation’s top five teams throughout the season, and games like this one really were the true glory days of the conference. Trailing 67-65, Indiana went to its star, Jay Edwards, who hit an improbable jumper from behind the backboard, seemingly as time expired to put the game into overtime, and with the crowd and momentum on the Hoosiers’ side. But, before the days of replay or tenths of seconds on the scoreboard, the officials had to rely on their own judgment, and in this case, that meant giving Illinois the ball with one second left. For some reason, Knight chose not to defend the inbounds pass, which turned out to be a perfect one directly to Nick Anderson, who was still well behind the three point line. Anderson had a enough time to catch, plant his feet and throw up a perfect 30-plus foot jumpshot that hit nothing but net as time expired. Ugh. As bad as the Wisconsin game had been earlier in the year, this was much worse, coming in the Big Ten Tournament Quarterfinals. The Sampson fiasco had played itself out, and Dan Dakich was running a team that clearly didn’t want to play for him. I’ve seen many frustrating losses to the Golden Gophers over the years, mostly when we had ten point leads with under two minutes to play (that happened twice under Davis), but this one takes the cake because we played poorly and trailed the entire game. Until the last few seconds, that is. That’s when trailing by two with 3 seconds left after a made free throw, Eric Gordon intentionally missed the second in a manner so perfect that D.J. White went up and grabbed the rebound and put the ball back up to tie the game at 57. 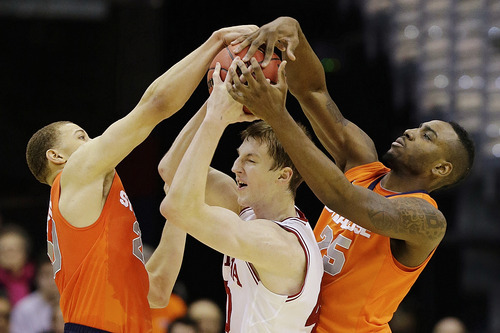 White was also fouled on the play, which meant that IU now had a chance to win the game! He missed the free throw, but recovered his own rebound and was fouled again. He drained one of the two free throws, and somehow, Indiana had a one point lead, and only needed to play good enough defense to stop Minnesota for 1.5 seconds. The ball flew like a laser beam through three Indiana defenders and through the only possible path to Blake Hoffarber’s wretched little hands. He threw the ball up so quickly that I could hardly even believe that he had caught it, much less believe that the ball was now making its way to the center of the rim and through the net for the Minnesota win. My Hoosiers, once a Final Four favorite in 2008, were then royally screwed by the selection committee and given a #8 seed despite their 25-7 record, and after all of that, lost without much of a fight in the first round to #9 seeded Arkansas. The mass exodus that followed would result in the never-to-be-mentioned 6-25 season next year, but this shot is the moment of that season that completely defined rock bottom. What could be worse than that? This was actually a tough call, but when I look back over the last 25 seasons, no loss was more painful to take than this one. Coming off a Final Four season in 1992, the 1993 Hoosiers returned all five starters and were ranked the #1 team in the nation heading into the tournament, something than even the 1987 champions could not say. Hopes for a national title were high after a 17-1 Big Ten campaign, but star power forward Alan Henderson’s knee injury prevented him from contributing in the regional final against a pesky Kansas team that had beaten the Hoosiers earlier in the year. Those Jayhawks once again proved too tough for the depleted but determined Big Red, and the most promising season since the last national title ended without even making an appearance in the Final Four. Looking back on that season, I’m not sure we would have won the championship anyway, as Kentucky had also beaten us already, Michigan had the fab five (although we beat them twice in Big Ten play) and North Carolina had it all. But still, it would have been nice to have a chance with a healthy, experienced team, especially considering that Kansas would lose to the eventual champion Tarheels in the semifinal. I still haven’t gotten over this one. The day begins with a nearly full field of two year old fillies which are always tough to separate. We’ll give the edge to Bris Prime Power selection SEPARATIONOFPOWERS, who holds the field high Bris and Beyer speed figures (104, 86) for her last out score in the 8f Frizette. That came over a dirt course labeled good and wasn’t a two turn race, so she’s not without questions drawing into the widest post of all for Chad Brown here. But the way she won that race driving through the finish combined with perhaps the strongest pedigree (by Candy Ride out of an Empire Maker mare) in the field leads us to conclude she will enjoy the added ground here. There isn’t a lot to knock about morning line favorite MOONSHINE MEMORIES, who is undefeated in three career starts, two of which came on this track and one of which was at this distance. She shows the fastest Beyer at the distance (86) and should a pretty clear trip from the center of the field. HEAVENLY LOVE is another winner at two turns as she exits a romp in the Alcibiades at Keeneland where she earned the field’s highest Brisnet figure at the distance (91). In a race where the pace often goes faster than expected, she’s worth using on top as she also boasts the best Late Pace figure at this distance on dirt. We will use these three in multis. WONDER GADOT looks like an interesting long shot after posting a solid figure winning her last. She’s never raced on dirt but is certainly bred for it and could conceivably move up here on the surface switch, and is another that could be moving late. ALLURING STAR may hang around for a piece as the likely pacesetter but fell back when beaten handily by the favorite in her last. Always one of the trickiest handicapping puzzles of the Breeders’ Cup event, this year’s turf sprint presents a unique paradox for bettors, as the two standout shippers most accomplished at the 5f distance are also the two least familiar with navigating races around a turn. Three year old filly LADY AURELIA looms large here off of two Group 1 wins at 5f and 6f in Britain over turf labeled good, and her towering field high Racing Post Rating (124) would seem to confirm her status as the one to beat here. Both of those races came over straight courses, but she does have a stateside win around a bend on firm ground to fall back on from April at 5.5f (101 Bris, 97 Beyer), which is good for the fastest Bris figure in the field at less than 6f in 2017. If you’re sold on her, then MARSHA deserves some respect as well considering she nosed her last out at this distance, although she wasn’t able to duplicate that performance in her last, and there’s some concern as to her ability to handle the turn here as she has never contested such a course. Still, her 122 RPR combined with her form lines and experience at the distance makes her a contender. She will receive first time Lasix here. PURE SENSATION figures to be the speed of the speed and this distance suits him, although he draws a tough outside post. He shows the highest Beyer this year at this distance (110) and a competitive RPR (118), and is probably the best pure 5f horse in the field. He held on well to be third in this race last year, and of course that race was run at 6.5f on a downhill course, so he should find this distance a bit more to his liking. He has won three of his last four at this distance, although all three have come at Parx and over turf with some give. DISCO PARTNER has been hot of late but has never raced a distance this short. Closing type will have to work out a trip from off the pace and may find this contest a bit too sharp. Bris Prime Power selection shows a 109 Beyer and 108 Bris figure at 6f and a 118 RPR so he isn’t without a shot; will need to stay in touch with the pacesetters as he did in his last, and that may be doable from the rail. HOLDING GOLD is another deep closer with competitive figs (107 Beyer, 107 Bris, 116 RPR) that may be overlooked off his last and offers value at his double digit morning line; could be the type to spice up the trifecta for those keying the favorite. For multi-race purposes, it feels like you either need to take a stand and single the favorite, or go at least five deep. All eyes will be focused on the highly acclaimed and accomplished UNIQUE BELLA in this race, and this three year old filly may go off as the biggest favorite of the day. She has fired a ridiculous seven consecutive bullet works, including two since winning her last at 6.5f over Grade 3 company. That came after a long layoff and she should be fully cranked for this off of the field high Brisnet Last Race figure she posted there (102). A three year old filly has never won this race but aside from that she is tough to knock on talent and is a must use on top; while she doesn’t hold a considerable edge on figures, the feeling is that she has room to improve and hasn’t yet shown her best. Those looking to beat her could do worse than to land on Bris Prime Power Selection FINLEY’SLUCKYCHARM, who showed a new dimension when winning the TCA at 6f in her last (98 Beyer, 101 Bris) sitting off the pace and taking over through the stretch. That’s a tactic that could suit her well in this race, and while she’s been more successful at 6f than 7f over her career she does have a win at this distance to her credit this year over Grade 3 foes. It bears mention that the winners of 5 of the 10 renewals of this race have used the TCA as their last prep. The horse for the course is SKYE DIAMONDS, who enters off a 6.5f win here in her last (97 Beyer, 99 Bris) and is two for two at Del Mar. She has a three month layoff to contend with but has won five of six starts this year. She bested last year’s champion FINEST CITY two back, and that one also enters off a long layoff similar to the one she used to spring this upset last year. She threw up a bullet 4f work last week and the back class is there off the freshening; not impossible. CURLIN’S APPROVAL owns the field high speed figures at the distance (104 Beyer, 106 Brisnet) for her Princess Rooney score at Gulfstream three back in July, but hasn’t been able to reproduce that form away from her home track, losing to three of these two back in Grade 1 company. If she can run back to it, she could grab a piece at long odds. PAULASSILVERLINING (3rd in this race last year) and BY THE MOON must be considered contenders as well, but the feeling here is that both have done their best running on off courses and that both may be slightly past their prime. Traditionally run at 10f, this race cuts back a full furlong this year over the Del Mar course, and that could have a significant impact on the outcome. It certainly sets things up well for the beloved favorite LADY ELI in her final career start. She’s won her last three starts, two at this distance, posting field high 9f speed figures in the process (104 Beyer, 101 Brisnet). She was just nosed at the wire in this event last year, and should appreciate the shorter distance combined with the relative lack of pace after a ten week layoff. The best shot to beat her may reside with foreign invader RHODODENDRON, who owns the field’s best Racing Post Rating (117) and enters off a Group 1 win in France at 10f for Aidan O’Brien on Arc Day where she bested three of today’s fellow shippers. That win came over softer ground but she does show a Group 1 win at 8f in Britain last fall and a Group 1 runner up this year at 12f, both over good ground, so she’s versatile in terms of both surface and distance. She’s in the right spot of her form cycle as O’Brien wins with 33% of his runners third off the lay. First time Lasix could be just the boost she needs and this distance could suit her perfectly if she can navigate a wide post with Ryan Moore in the saddle. If we like that one then it’s hard to dismiss the chances of WUHEIDA at a nice price, considering she finished just a half length behind her in 4th last out, and has also won an 8f Group 1 in France over good ground and gets first time Lasix as well. Her Racing Post Rating (114) is equal to that of the favorite and she has worked well this week over the track. Defending champion QUEEN’S TRUST hasn’t won since this event last year, and let’s face it, she needed every inch of that 10f to get there, which she won’t get this time. Closer hasn’t been in the best form this year running over soft courses and could benefit from the surface switch but the race shape doesn’t exactly set up for and she is likely to desire more ground. The same can be said for Beverly D winner DACITA, who has won at 9f but does her best running over more ground, and WAR FLAG, who bested that one last out over 10f. Of the three, we prefer DACITA’s chances best to be flying for a piece. She has defeated GRAND JETE in her last two, and that one continues to attract more money than she should to our eyes. CAMBODIA earns horse for the course honors here and steps up in class off of back to back wins at Del Mar and five consecutive ascending speed figures; she’ll need another one to hit the board here. The most interesting shipper longshot is probably SENGA, who may be overlooked here after a poor showing in her last. That came over soft turf at a longer distance though, and a closer investigation reveals that all three of her career wins have come over firmer ground. Her high RPR of 112 won’t get it done here, but she stands to improve with first time Lasix, bombs away underneath. Ten runners line up for a highly competitive edition of this race a year after a short, somewhat watered down field. Four runners figure to vie for the lead; they are difficult to separate and it is hard to see any of them backing up much at this distance. The strongest and most consistent has been ROY H, and the 111 Beyer he posted in June at Belmont tops the field at this distance. He’d be undefeated this year if not for fanning six wide two back due to having to avoid a riderless colt he’ll see today, and he still managed to hang on to 2nd. His position outside here should allow a favorable trip to rate just behind the speed and get first run in the stretch, and an old rule of thumb of ours in this race has been to simply key in on the fastest 6f speed figure; all else equal, that horse is often the winner. The aforementioned colt of course is defending champion and Bris Prime Power Selection DREFONG who will break from the #2 post just as he did last year and enters off a similar pattern, having been rested 10 weeks since a 7f win at Saratoga (107 Beyer, 106 Brisnet). He meets a far saltier group this year however and it’s hard to imagine him getting as easy a trip as he received last year, same post position or not, although he is fortunate to be drawn between mostly off-the-pace types. He’s clearly the one to beat but could be a bit more vulnerable than his odds suggest. Perhaps more intriguing in terms of upside is IMPERIAL HINT, who steps up in class here following a Grade 3 win at this distance where he won in an absolutely absurd 1:07.2 (109 Beyer, 111 Brisnet), good for the best last race figures in the field and his fifth consecutive triple digit numbers. He’s been working gangbusters since, posting two bullets and could really be any kind. We like his draw outside the speed as well. TAKAFUL figures to be the one most likely to hook up with the favorite on the early lead based on his field high Early Pace numbers as he lines up in the middle of the field. Talented three year old holds the field high Brisnet speed figure at this distance (114) and has found his niche sprinting in the second part of the year, but it’s fair to wonder whether engaging the defending Sprint champion in an all out speed duel bodes well for his win chances. Closers like MIND YOUR BISCUITS (3rd last year), CALCULATOR and WHITMORE seem better suited to 7f races, especially in a spot such is this where the speed isn’t cheap and feels unlikely to collapse. Speed on the rail! The two main speeds in the race drew posts one and two, which virtually ensures a wicked pace. We’ll toss MIDNIGHT STORM and HEART TO HEART, both talented six year olds that figure to lock up early and expend too much energy in this spot. WORLD APPROVAL has really found his niche at this distance and this race has treated the home team well in recent California editions. Winner of his last two at 8f including a decisive score over today’s foe LANCASTER BOMBER, grey owns the best speed figures at that distance (duplicate 108 Beyers, 103 Brisnet) and a competitive RPR relative to the Euro shippers (123). What we really like is his ability to rate off the likely torrid pace with a target to run at and time his move forcefully as he owns the best Average Late Pace figures in a field loaded with speed; he will take a lot of beating with John Velazquez aboard. Of the shippers, our preference is the French-based ZELZAL, who gets first time Lasix and has done his best running over firmer courses, showing a Group 1 win at this distance over good turf last summer. His career high RPR of 122 fits here and if he can move up a bit from that number on the firm turf with the Lasix addition, he’s a win contender at a giant price. On paper, British shipper and morning line favorite RIBCHESTER looms the horse to beat in his final career start off his field high 127 RPR and four career Group 1 wins at the distance. Something feels a bit off here though, with his subpar performance in his last, defeated by a colt who had just lost to today’s foe ROLY POLY, combined with a quick turnaround of just two weeks (space between races this year has consistently been five weeks). We’ll use him on top defensively in multis but will maintain that the value in this race may lie in keeping him off the top line in exactas and trifecta. Bris Prime Power Selection SUEDOIS deserves a look off his closing win in the 8f Shadwell (Beyer, 100 Brisnet). He’s one of the few Euro shippers to have won in the US this year but will need to improve on that number. The aforementioned ROLY POLY (RPR 116) and LANCASTER BOMBER (RPR 119) round out the Euro threats and deserve a look as well based on their class lines. The latter seems more likely to benefit from the race shape despite a quick two week turnaround, while the former may be better suited to a straight course than a wide draw around a turn. At least on paper, this is the race on the card that offers the most glaring mismatch. Therefore, to single or not single BOLT D’ORO becomes the biggest decision of the Late Pick 4 sequence. He holds a towering speed figure advantage over this field, having posted a 100 Beyer (revised down from 113) for his Front Runner win at this distance, a 10 point advantage relative to his closest foe. Before that, he won two races over this track. Drawing into Post #11 should allow him to allow him to stalk the pace setters and get a great trip near the lead. Simply put, if he runs back to his Front Runner, he wins by open lengths. The argument against singling him is that everyone else will be doing it, so in the event he loses, having another horse could provide payoffs much higher than it would in the regular win pool. FREE DROP BILLY looks to have the most upside off his two turn win the Breeders’ Futurity (79 Beyer). That figure equates to a double digit length gap to make up against the favorite, but the ease with which he won that race might indicate that he wasn’t asked for his best. Strong pedigree is there (by Union Rags out of a Giant’s Causeway made) and he’s been working brilliantly, posting a bullet on 10/21 that was the best of 70. A couple of Curlin progeny round out our picks as both figure to improve. SOLOMINI was 2nd in the Frontrunner behind the favorite, but that was good enough for an 86 Beyer, the 2nd best two turn figure here. He had previously broken his maiden over this track. GOOD MAGIC was a hard luck 2nd in the Champagne, posting an 89 Beyer after leading in the stretch. We’ll give him a shot to turn the tables on the horse that beat him there, FIRENZE FIRE, who hasn’t looked great over the track this week. British turfer US NAVY FLAG strangely lands in this spot instead of the Turf race where he would have been favored Friday, and while he deserves a look based on his connections, he’s never contested a dirt race or a route race. A very deep field of turfers are led by the defending champion globetrotter HIGHLAND REEL, who slips into a cozy spot along the rail with Ryan Moore in the saddle. It’s unlikely he will go off anywhere near his morning line odds, especially considering he went off at 4-1 last year, but he may be overlooked enough off his recent form to still offer value. He switches back to firm turf after two well beaten starts over softer going. He had won two Group 1 events prior to that over ground labeled good (123 RPR, highest in the field at this distance over firmer turf), beating two of today’s fellow shippers, and a repeat of last year’s performance (112 Beyer, 114 Brisnet) would likely earn a repeat trip to the winner’s circle; none of these runners have equaled those figures on a firm turf course since then. He may see a bit more pace in this spot than he did a year ago, but he doesn’t have to have the lead and doesn’t figure to expend too much energy early. This is one of our strongest win choices on the day. Morning line favorite ULYSSES returns after a 4th place finish in last year’s event, boasting a field high 127 RPR off his Group 1 win in the 10.5f Juddmonte International over soft ground two back and a respectable 3rd in the 12f Arc de Triomphe in his last. He’s improved massively in his four year old season and beat the top selection three back at this distance, again over softer ground. His record over firmer surfaces leads us to lean another direction here but he would certainly be no surprise and must be used on top. These two appear a cut above the American contingent, but in the event that a pace meltdown does in fact materialize, SADLER’S JOY might be the most likely to capitalize from off the pace. Winner of the 12f Sword Dancer two back at this distance (105 Beyer, 104 Brisnet) closed into a slow pace in that race and never really got moving in his last when 6th. With a bit more pace to run at, he could be flying late. Bris Prime Power Selection BEACH PATROL, who beat him in has last, has gone from a horse whose limit was once believed to be 9f into the top turf threat in America following wins in back to back Grade 1 races run at 10f and 12f (109 Beyer, 111 Brisnet, 117 RPR). Whether he can withstand added pace pressure against this kind of quality remains to be seen but he is certainly eligible to be around at the end. He seems far more potentially impactful than OSCAR PERFORMANCE, who has put together a nice year as a beneficiary of easy leads the likes of which he isn’t likely to see here. BULLARD’S ALLEY freaked in his last and enters with the highest speed figures in the field at this distance (114 Beyer, 120 Brisnet) but those numbers are such massive outliers to his prior form over a long career that they certainly have to be attributed to the soft turf that day. A few more shippers enter with longshot potential. DECORATED KNIGHT won the Group 1 Irish Champion at 10f (121 RPR) in his last and actually finished ahead of the favorite at that distance and over good ground in the Group 1 Prince of Wales. He may not want to run quite this far and never has, but he’s run well at shorter distances against classy company. The opposite may be true for SEVENTH HEAVEN, who takes on the boys having finished a closing 4th in last year’s Filly and Mare Turf; that race is too short for her this year. She is a Group 2 winner at 12f this year (120 RPR) over firmer ground and had won two Group 1 events at that distance as a three year old over turf labeled good. She should appreciate both the distance and surface in this spot. It’s hard to believe that Bob Baffert has won the last three editions of this race with three-year old colts. Enter WEST COAST, who looks poised to continue that trend as the value of this year’s event. Winner of five straight is proven at the distance, having impressively wired and drawn away from the Travers field (108 Beyer, 112 Brisnet) in his lone 10f try. He absolutely destroyed the Pennsylvania Derby field in his last and has been firing bullets since. Drawn in Post #8, he should be able to work out a nice tactical ride outside the main speed. Javier Castellano picks up the mount from Mike Smith, who jumps off to ride ARROGATE, and one can hardly blame him. Defending champion is clearly the horse to beat on paper if he can return to his early year form and 2-1 will look like an absolute gift if he does. He posted the highest number of the year when winning the 9f Pegasus in January (119 Beyer) and overcame a ton of adversity when running against his style to close and win the 10f Dubai World Cup in March. He fired a bullet work on 10/30, will be sent early from the rail where he started for two of his greatest victories, and should be expected to turn the tables on today’s foe COLLECTED, who hung on to pull the upset last out over this track at 10f. Amazingly a colt that couldn’t even make last year’s Kentucky Derby field finds himself in position for Horse of the Year honors coming off an upset of what was once widely considered the world’s greatest horse. COLLECTED will see a bit more pace pressure here and doesn’t appear to be bred for 10f but the proof is in the pudding. He’s never lost in seven starts on a dry dirt surface and he must be considered a candidate for the win. Morning line favorite GUN RUNNER has done absolutely nothing wrong and seems to be getting better with every race. His ten length romp in the 9f Woodward in his last produced career high figures (115 Beyer, 114 Brisnet), and he’s earned nothing but rave reviews working over the track. The main concern with him at these odds is that while he has never turned in a bad effort, he is 0/3 in 10f attempts, beaten twice by ARROGATE. Those two figure to go at it early and we won’t let him kill our Late Pick 4 ticket, but all else equal we prefer the champ for the top of vertical wagers. Our Triple Crown favorite GUNNEVERA comes in off a career best in his last when 2nd in the Travers. He’d be a surprise for the win but has the kind of push button speed that could make an impact in exotics if timed correctly. He improved 24 Brisnet figure between his last two starts; if he can improve even half that many, who knows? Euro shippers CHURCHILL and WAR DECREE find themselves in ambitious spots here in terms of distance and surface compared to this competition. We feel confident that out five will cover the superfecta. Included for each runner is their top Brisnet Speed Figure and top Racing Post Rating at the closest distance and over the surface over the past full year. Beyers provided within the text where applicable. 1 AFANDEM (9-2, BRIS N/A, 112 RPR) Has shown ascending Racing Post Ratings in his three 2017 starts in Europe and makes his U.S. debut here for trainer Jean Claude Rouget. He shows a win at the distance in Stakes company and is Group 2 placed at the distance as well. It remains to be seen how son of Zoffany will take to the firm turf here, as his two prior turf starts have come on good and soft ground, but improving sort has never finished worse than 2nd and has won three of his four career starts. His RPR figures aren’t that far behind the favorites, who gift him a nine pound weight break in this spot as expert tactical rider Frankie Dettori takes the mount and could find a cozy spot on the rail behind a likely speed duel. 2 SONIC BOOM (8-1, 89 BRIS, RPR N/A)- Won the local prep for this, the American Derby at 9f (85 Beyer) but appeared to be losing ground in the stretch after setting the pace, and now stretches out to 10f for the first time against some classy Euro shippers that also tend to run on the lead. Sire More Than Ready doesn’t flatter his ability to wire this field going 10f, pass. 3 PERMIAN (9-5, BRIS N/A, 114 RPR)- Godolphin sends this seasoned charge for his first U.S. start off a 2nd place finish in the Group 1 Juddmonte Grand Prix de Paris at 12f in his last. He won the Group 2 King Edward VII Stakes at the same distance the race before that, and this pacesetter looms extremely dangerous on the cutback here. All told, he boasts three wins at this distance and beyond, while no other runner in this field has more than one. In a short field, he is a tempting single, but will make his eighth start of the year following his first ship abroad for a trainer who rarely runs here; not invincible. 4 OSCAR PERFORMANCE (8-5, 98 BRIS, 114 RPR)- Juvenile Turf champion got off to a rough start this year when off the board in his first two starts, both at 8.5f. He’s rebounded nicely, winning his last two starts in wire to wire fashion as distances have increased- the 9f Pennine Ridge (93 Beyer) and 10f Belmont Derby (96 Beyer), the latter a Grade 1 event. He got away with pretty easy leads in those wins (:49.92, :49.48) and will face more seasoned front-runners and perhaps extreme pressure here, but still appears the prominent American threat in this short field. 5 GORGEOUS KITTEN (12-1, 88 BRIS, RPR N/A)- Runner up in the local prep for this, the American Derby at 9f (82 Beyer), son of Kitten’s Joy has never contested beyond that distance. He finds an ambitious spot here in terms of figures but was gaining into the finish of his last, and his pedigree suggests potential for improvement with added ground. He’s the only true closer in the field and could make some noise undernaeth if the likely pace duel materializes. 6 TAJ MAHAL (5-1, BRIS N/A, RPR 113)- Son of Galileo has kept top company, racing four times at 10f or beyond in Group 1 races in Europe, but has missed the board in all of those attempts and shows just one win in 14 career starts, and that wasn’t even over turf. One-dimensional runner figures to go straight to the lead and try to run them all off their feet, but his Racing Post speed figures have been in decline over his last four races. His fastest race came over good/soft ground which he won’t get here. Aidan O’Brien has had a lot of success in this race and he gets Ryan Moore aboard, which is hard to overlook, and he does receive first time Lasix and a nine pound weight break from the favorites. 1 MONGOLIAN GREYWOLF (30-1, 84 BRIS)- Cross-entered in Race 4, which might be a more realistic spot for son of Paddy O’Prado to attempt to break his maiden. 2 JUSTICE PREVAILS (30-1, 83 BRIS)- Broke his maiden in his seventh try two races back but was beaten handily by optional claimers in his last. Steps way up in class here and has never raced on the all-weather surface. 3 HARMAC (12-1, 88 BRIS)- Winner of his last, an 8f allowance, he steps up in class here and has never raced on synthetic. Trainer Grant Forster is 40% with dirt to synthetic runners but we would like to see at least some experience in his past to support him here. 4 SMOKE N GLOAT (9-2, 94 BRIS)- Speedster shows two wins and two seconds in five starts over the Arlington all-weather track and has won all of his 2017 starts ranging from 5.5f- 8f. His most impressive race to date came two back at this distance over this track as he was able to carry his speed through rapid fractions and maintain his advantage. He’s fired a bullet since then and is the only runner in the field with an 8f polytrack win on his resume; seems logical if he can withstand a likely pace duel with Uncontested. 5 KITTEN’S CAT (7-2, 84 BRIS) -Son of Kitten’s Joy out of the Mike Maker barn figures to take action on those angles alone, but he will try synthetic for just the second time in his twelfth career race after having spent the rest of his career on the turf. He was a close 4th in his only synthetic attempt, the 8.5 f Sprial, a Grade 3 contest. He hasn’t won since taking his sire’s namesake distance over the turf back in February and has been pretty consistent in the low to mid 80s in terms of speed figures. There’s not enough here on paper to support him based on his likely underlay status. 6- GAIN GROUND (12-1, 90 BRIS) -Lightly raced son of Tapit gets Joel Rosario aboard as he cuts back slightly following a 2nd place finish at 8.5f against optional claimers here in his last, where he posted a competitive figure. He held the lead in that race at the 8f mark and closer should get plenty to run at here in his third career start for trainer Eoin Harty who wins with 21% of his all weather starters. 7- YORKTON (5-1, 92 BRIS)- Has won his last two, including an 8f turf stakes at Woodbine in his most recent start and a 7f stakes triumph over the Woodbine Tapeta surface before that, where he extended through the stretch after leading from the jump. There isn’t much question about the distance here for son of Speightstown who looks poised to combine the speed of his sire with the AP Indy stamina influence he receives on bottom. Checks all the boxes but could get caught in an early speed duel. 8- UNCONTESTED (3-1, 97 BRIS)- Speedy and talented, but has never raced on synthetic and has tended to fold early when on the lead, as he’s retreated in his last three starts while setting the pace against graded company. His only win since his maiden came over a sloppy track at this distance, so it’s anyone’s guess as to how his form will translate to this surface, although sire Tiz Wonderful does leave some room for optimism on that front. More concerning is his ability to withstand the speed duel he is likely to encounter here , especially off a three month layoff. 9- MEMORY BANK (12-1, 86 BRIS)- Recent maiden winner moves up in class for this third career start for trainer Michael Sitdham who wins with 24% of his all-weather starters. He stands to improve here but may find these waters a bit too deep. 10- SOCIETY BEAU (6-1, 100 BRIS)- Shows a field high BRIS speed figure for his last effort, a win at 8f over optional claimers, but that came over a muddy, sealed track. Dirt runner has never run on synthetic but is impeccably bred, by Curlin out of an AP Indy mare. His BRIS Late Pace Last Race figure tops the field but we will side with the closer that has shown abiity over the surface at double the price. 1 KEYSTONEFORVICTORY (5-2, 108 BRIS, RPR N/A)- Won the local prep for this, the Stars And Stripes (95 Beyer), while gaining steam into the stretch, good for the highest last out BRIS figure in the field. He has now won back to back 12f races, more than any other starter. He goes third off the lay for Mike Maker who wins with 25% of his runners in that spot of their form cycle and would appear to be begging to stretch out further here as he has gained over two lengths in the stretch of both of his 12f wins, but has never gone this far before. 2 TAGHLEEB (2-1, 109 BRIS, 111 RPR)- Stretches out to a more appealing distance following a 5th place finish in his last, the 9.5f Arlington Handicap. He’ll try to turn the tables here on today’s foe Bullard’s Alley, who was 3 lengths better two back in the 2 mile Belmont Gold Cup, although neither really brought their best race that day, and Taghleeb was ahead of that foe at the 14f mark. He has triplicated the highest Racing Post Rating at 12f or beyond, most impressively back in January with a powerful late running score in the 12f W.L. McKnight (100 Beyer), and owns the speed highest figure in the field off of that effort. Looms the one to beat on paper if he runs back to it; all systems ago on the strength of a recent bullet work. 3 CREWMAN (15-1, 90 BRIS, RPR N/A)- Winner of the local graded stakes Hanshin Cup at 8f on the all-weather track (98 Beyer) was a well beaten 7th in his last in the 9.5f Arlington Handicap on the move back to turf and will look to stretch out massively here having never raced beyond that distance. Could have a say in the outcome as he figures to be part of the faster than usual early pace but we can’t see him sticking around for honors. 4- ALPHA WARRIOR (30-1, 85 BRIS, RPR N/A)- Seems ambitiously placed, as three time allowance winner takes a big step up in class second off the lay following a runner up finish beyond two miles at Mountaineer Park. He was a two time winner at 14f and beyond last year there but meets tougher foes here and has a big gap to make up in terms of speed figures. 5 TOBIAS (30-1, 83 BRIS, 98 RPR)- 8 year old will give this race another try after a 6th place finish last year, but is 0 for 4 at 12f or longer for his career, and has just one win in 32 career starts. Would be a surprise considering he finished 7th some eighteen lengths behind optional claimers in his last. 6 APPLICATOR (9-2, 106 BRIS, 100 RPR)- Need-the-lead type hung around for 3rd in the local prep for this, the Stars and Stripes, where he posted a 93 Beyer. He hasn’t won in awhile but his most recent win was at the 12f distance in May of 2016. He’s finished a combined 15 lengths behind the favorite here today in his two marathon tries against him, but gets blinkers today and could take them a long way on the lead and stick around for a piece. Enters off a bullet work over the track; should be eager. 7 POSTULATION (5-1, 98 BRIS, 90 RPR)- Was 6th behind today’s foe Bullard’s Alley at 12f last fall but did score at that distance in his most recent start against stakes company in the Cape Henlopen (97 Beyer). That came over firmer turf in wire to wire fashion under soft fractions, but he will take a step up in class against these as he hasn’t yet won a graded event. Trainer Ed Graham won the 2014 Million with Hardest Core and wins with 48% of his next out dirt route winners. 8 BULLARD’S ALLEY (6-1, 109 BRIS, 110 RPR)- After spending the winter racing at distances far too short, he stretches out here following a 2nd place finish in the 12f Singspiel (92 Beyer). He shows a Grade 3 place and win at that distance as well and will look to benefit from additional ground here, although it bears mention he was leading in the stretch and was subsequently caught at the wire in his last. He hasn’t been the most consistent type, as he was 5th in last year’s Stars and Stripes as the second choice and has raced 13 times since his last trip to the winner’s circle, but appears well suited against these in terms of marathon class, speed figures and experience. BRIS Prime Power selection could be in the right spot to make an impact at a square price. 1 DACITA (4-1, 105 BRIS, 114 RPR)- Chilean bred mare scored one of the largest wins in this division last year in winning the 10f New York Stakes (96 Beyer) over Sea Calisi who won this race in 2016, but her form has seemingly trailed off as a six year old. She could only muster 6th in her defense of that race in her most recent start, and although the race shape played against her, that was her second consecutive loss to Hawksmoor who she’ll contest again today. However, looking back to her 2016 form, her close 2nd to today’s foe Rainha da Bateria at Woodbine last fall in the Canadian Stakes (101 Beyer) merits a close look. She earned the field’s highest Racing Post Rating as she devoured two lengths in the stretch to miss by a nose over a soggy track at a distance shorter than this and while giving 9 pounds to the winner. Woodbine form tends to translate well to Arlington, and any return to prior form for off-the-pace type could turn the tables here as she enters third off the lay for the dangerous Chad Brown barn which has won the past two editions of this race. BRIS Prime Power selection figures to have a better setup today with firmer ground and more pace to run at and could be the value play of the day. 2 PRADO’S SWEET RIDE (30-1, 93 BRIS, 94 RPR)- Local hero was 2nd over this turf course last out in the Modesty (97 Beyer). She takes a bit of a class leap but does have a 9f win in the Grade 3 Regret from last year (81 Beyer). Her most recent figures aren’t incredibly far off from the rest of the field but she hasn’t won against this type of company nor running this far. She’s met today’s foe Kitten’s Roar three times but has never finished ahead of her. 3 KITTEN’S ROAR (12-1, 91 BRIS, 106 RPR)- She’s kept classy company of late, finishing 4th in the Grade 1 Jenny Wiley and gaining late against the likes of Lady Eli and Dickinson at 8.5f. She was 3rd in the 10f New York Stakes (98 Beyer) in her last behind Hawksmoor who she meets here again today, but she didn’t have a favorable setup to mount her late charge as that one got away with easy fractions up front and wired the field. She’s still winless in stakes company but the distance should fit from a pedigree standpoint, although she hasn’t won going this far. Her most recent win came in January as she held off a late charge from today’s foe Prado’s Sweet Ride in an 8.5f Stakes at the Fairgrounds (91), but it’s worrisome that her three most recent wins have all come over softer turf courses. 4 DONA BRUJA (7-2, 94 BRIS, 108 RPR)- Winner of five straight enters off her recent win in the local Modesty prep at this distance (99 Beyer) on the strength of four consecutive bullet works. She closed into a slow pace in that race (:50.37 opening half) to post the top BRIS Late Pace Last Race figure in the field and should get a better pace setup here. Argentinian bred is in career form, appears to love the track and figures to take a lot of beating. She’s only raced twice in the U.S., however, and hasn’t yet beaten anything above Grade 3 company. Favorite could be overbet after her recent win over this course but would be tough to leave out altogether. Five year old mare makes for an intriguing South American bred story line as she faces off against Dacita for the first time. 5 GRAND JETE (6-1, 91 BRIS, 85 RPR)- Has won all three starts in 2017 since arriving from Great Britain. Daughter of Dansili takes a class leap here having won the 8.5f Grade 3 Eaterton at Monmouth (95 Beyer) two back where she bested today’s foe and defending show finisher Zipessa. She’s never raced beyond that distance but stretches out here on the strength of powerful late rushes in all three of her wins at shorter distances. An intriguing price in this race given the strong connections of Chad Brown and Joel Rosario; there’s a bit of a wise guy feel here with this one though and her speed figures are second tier in the spot. 6 ZIPESSA (15-1, 106 BRIS, 107 RPR)- Pacesetter returns to the scene after taking them as far as she could in this event a year ago and holding on for 3rd place honors. She meets a saltier group this time around however. She should enjoy the cutback following a 2nd place finish in her last in a 11f Grade 3, but this still may be a bit further than she wants to go. She has never won going further than 8.5f or above the Grade 3 level, and it is hard to elevate her above today’s foe Grand Jete, who beat her on the square two back and separated through the stretch at a shorter distance. One has to raise an eyebrow when viewing her field high 106 BRIS speed figure, which came in a lackluster 5th place finish at the Breeders’ Cup, as she’s never earned a triple digit figure in any other of her twelve career races. 7 RAINHA DA BATERIA (6-1, 105 BRIS, 106 RPR)- Consistent and versatile mare exits a 10f dead heat win over firm ground in the Grade 2 Dance Smartly at Woodbine (95 Beyer), a course that generally translates quite well to Arlington. Last year, she held off today’s foe Dacita over that same track in the 9f Canadian Stakes (101 Beyer) over a track labeled good, although she has finished behind that one twice in the last year. She was a closing fourth over yielding ground two races back in the Beaugay, losing to Dacita and Hawksmoor, but the added ground and firmer surface gives her a chance to turn the tables. One of three entrants for Chad Brown, who has owned this race of late. 8 SARANDIA (30-1, BRIS N/A, 105 RPR)- German shipper figures to show speed early and be a part of the pace. She shows a Group 2 placing at 11f and three wins at that distance amongst stakes company, all over good to soft ground, so she will be cutting back a bit here and racing over an unfamiliar surface. 9 HAWKSMOOR (9-2, 93 BRIS, 108 RPR)- Irish-bred filly has won her last two starts in wire to wire fashion, including the 9f Beaugay (100 Beyer) over yielding turf and the 10f New York Stakes over firm ground (102 Beyer). She put the naysayers to rest in the latter, as she had previously shown specific affinity for off going. The red flag here lies not in the surface condition but in the easy leads she capitalized on in those scores (:51.20 and :49.72 respectively). She is likely to see more company up front here and may very well be an underlay off her prior two efforts and field high Beyer figures, which run somewhat in contrast to her BRIS numbers. Combined with the likely firm turf and on the heels of a two month layoff, the feeling here is that the time to be on her has passed, and we’ll aim to keep her off the board in this spot. 10 RAIN GODDESS (5-1, BRIS N/A, 112 RPR)- Aidan O’Brien (1 for 17 with first timer runners in North American) shoots for his first Beverly D score as his shipper cuts back following two impressive Group 1 runner-up finishes in the 12f Irish Oaks and 10f Pretty Polly Stakes, both over good ground. In the latter, she defeated Zhukova, who had previously destroyed American males by 6 lengths in the Grade 1 Man O’War over 11f, and in the former, she was bested only by Enable, who may well end up the favorite in the Arc de Triomphe. Based on that, one could argue that even this competitive field offers some class relief. She shows ascending Racing Post ratings in each of her last five starts, the most recent of which is highly competitive here. She was running on late in both of her last two races so she may leave herself a bit too much to do at the shorter distance, and it also bears mention that while she’s kept classy company, she still has no wins above the maiden level. Three-year old daughter of Gaileo gets first time Lasix and a six pound weight advantage here however and has every right to be in the mix if she takes to the surface and handles the ship after a busy campaign. Ryan Moore gets the mount, and the last time he was here in 2014, he took two of the four festival races. 1 OAK BROOK (30-1, 94 BRIS, RPR N/A)- Surprise runner up finisher at 45-1 in the local prep for this takes a massive step up in class having never won a graded race or any race beyond 8.5f. Bombs away if you are feeling illogical. 2 OSCAR NOMINATED (15-1, 93 BRIS, 109 RPR)- Seasoned son of Kitten’s Joy has shown versatility racing between 8.5f and 12f over the last year but has never won a graded stakes on turf. He’s spent most of the year running behind the likes of Beach Patrol, Divisidero, Enterprising and Kasaqui who he meets again here and we tend to like the chances of those a bit better for the home team. 3 ENTERPRISING (30-1, 93 BRIS, 110 RPR)- Made a name for himself this winter winning a couple of gutsy 9f races at the Fairgrounds (96 Beyer), but has yet to contest beyond that distance. The pedigree suggests that this may be a bit further than he wants to go, but he was gaining ground in the stretch of both his graded 9f wins. His form since then leaves a bit to be desired, as he’s turned in off the board 6th place finishes in his last two, beaten by three of these. 4 GHOST HUNTER (30-1, 95 BRIS, RPR N/A)- Sprung a bit of an upset from a stalking position in winning the local prep for this, the Arlington Handicap at 9.5f (98 Beyer). He may have won that race a bit by default as favored Kasaqui had a terrible trip and he only held off a 45-1 shot by ¾ of a length. He was only a half length behind today’s foe Ascend four races back but that came at a mile, and he’ll need to improve upon his last speed figure to compete amongst these. 5 DEAUVILLE (7-2, 94 BRIS, 117 RPR)- Finished third in this race last year, missing the win by a half a length in a rare three year old attempt at the Million crown. He returns for another chance having improved greatly in the past year and earns morning line favoritism off the strength of two Group 1 placings and a Group 3 win in Europe. He stacks up well against some of Europe’s best measuring by his close 2nd place finish to Ulysses at this distance in April after he returned from Dubai. He earned a field high Racing Post Rating for that effort and was flattered when Ulysses came back to run 3rd behind the highly regarded Highland Reel in the Group 1 Prince of Wales, missing by just 1 1/14 lengths. Today’s foe Mehktaal wound 3.5 lengths behind the winner, so Deauville appears to fit in between- behind Ulysses and ahead of Mehktaal- at this distance. He’s been running primarily over good to soft ground overseas and should be expected to move up on a firmer surface given his performance here last year and win prior in the 10f Belmont Derby. Aidan O’Brien has a deserving favorite here as the tactical speed and form lines of Deauville should prove difficult to beat in this spot. 6 FANCIFUL ANGEL (30-1, BRIS N/A, 101 RPR)- Forwardly-placed type gets first time Lasix for his first American start. He has a single win at this distance but that came over synthetic track, and has spent most of his turf career running 8f races. He was an off the board 6th in stakes company in his first 10f turf try, so this seems an odd spot to ship over considering the strength of the other shippers. Should ensure an honest pace if nothing else. 7 THE PIZZA MAN (12-1, 94 BRIS, 111 RPR)- 2015 Arlington Million winner returns for what has to be his final race over this course where he has amassed ten career victories. He benefited from a pretty weak field two years ago though, and now as an eight-year-old, old-timer may have lost a step. The feeling here has always been that he needs a bit more ground than the 10f trip offers, and his only two wins since his Million score have come at the 12f distance. He tends to be an underlay at this track due to his popularity, so we’ll make him beat us again as we always have, especially as this race comes up as deep as it has been in recent memory. 8 KASAQUI (10-1, 94 BRIS, 113 RPR- Last year’s runner up missed by just a neck in that race and returns for redemption after a tough luck 3rd place finish in the local prep that should provide ideal fitness for this attempt. He’s contested distances all shorter than this one since last year’s race, and perhaps that’s the reason for him having won just once in his seven races since. That was a 2 ¾ length score in the Grade 2 Wise Dan at 8.5f (102 Beyer), but this really is a true 10f horse who won twice at that distance before shipping from Argentina. He should enjoy the slight stretchout here over a track where he has never missed the board in three career starts. His mid-pack running style should set him up nicely with plenty of pace signed on, and he could be overlooked again at the windows despite his prior success here. All eyes on the grey. 10 BEACH PATROL (5-1, 95 BRIS, 113 RPR)- Hard-knocking speedster was victorious in last year’s Secretariat, his first win over 10f, and subsequently threw together a string of second place finishes at 9f before faltering in his most recent two starts at longer distances. He’s been winless for the entire year and his forwardly placed style has always seemed to lend itself better to 9f races to our eyes. He didn’t really have much of an excuse when 4th two starts back to 30-1 shot Ascend, who he’ll meet here again. Divisidero caught him from off the pace in the 9f Turf Classic on Derby Day, and the 11f distance of his last race is just simply further than he wants to go. He should enjoy the cutback here, and while his Secretariat last year compares almost identically in terms of speed to Kasaqui’s Million run, we prefer the latter in this spot purely due to race shape. However, he rarely throws in a downright bad effort, and his tactical speed renders him useable on the bottom of exotics. 11 DIVISIDERO (5-1, 90 BRIS, 114 RPR)- Deep closer has been unbeatable in 9f races at Churchill but hasn’t been able to duplicate his closing punch away from that track or at the 10f distance, as he is 0 for 3 and has been off the board in all of those attempts. In his defense, he didn’t have much pace to run at when a better-than-it-looked 6th last out in the Manhattan at Belmont, as he sat back off a pace that crawled along in :50.0 for the half. He looked fantastic as he devoured Beach Patrol when winning the 9f Turf Classic two back at 9f (102 Beyer), but it is tough to support him for the win given his form lines at this distance. Perhaps the Arlington turf course, being more similar to Churchill in configuration and speed, will move him up, and he figures to be gobbling up ground late with a bit more pace to run at this time. Useable underneath. 12 ASCEND (10-1, 93 BRIS, 108 RPR)- Surprise winner of the 10f Manhattan two back at 28-1 odds (104 Beyer), five year old son of Candy Ride was unable to substantiate that effort in his most recent attempt, finishing 4th in the 11f Bowing Green at Saratoga, perhaps running a bit too close to the pace. The field high Beyer figure will likely turn some heads and he will appreciate the cutback off that effort, but he draws wide here against a tough group after getting a pretty easy trip in his upset score, and the two week turnaround may be a bit on the sharp side for this up and comer. 13 MEKHTAAL (9-2, BRIS N/A, 115 RPR)- Son of Sea the Stars drew widest of all for his first American turf attempt. He’s kept top company in Europe, and finished just behind Scottish, who he meets again today, in the 10f Prince of Wales. He has won twice at this distance in Group 2 and Group 3 company which looms the most formful of the Euro shippers, and he’s run seven times at this distance, finishing worse than second only once. Some of those race came over ground labeled good to soft but he has won twice over ground that was probably on the firmer side of “good”. Running without Lasix, he figures to be placed forwardly by Frankie Dettori, as he’s done his best running on or near the pace, and won’t want to get caught wide from this post. His combination of tactical speed, form and speed figures put him squarely in the mix here if he can circumvent the firm ground and post position. 1 ROYALTY PRINCESS (30-1, 74 BRIS)- Should show early speed from the rail but goes blinkers off here. Hasn’t been able to sustain leads and stretches out after falling back in the stretch in her last two. 2 FAULT (8-1, 93 BRIS)- Closed like a freight train in her last when running against her typical style, making up four lengths in the stretch to just miss the win at 8f in the Ta Wee stakes, and passing today’s favorite Lovely Bernadette in the process. She’ll seek her first win outside optional claiming company but could get sucked up into a wicked pace from the rail here, and faded two starts back in that scenario after leading in the stretch, but if she can take back off the lead a bit, daughter of Blame should hae no trouble at the distance. 3 LIPSTICK CITY (4-1, 88 BRIS)- A Chad Brown trainee being ridden by Joel Rosario is sure to take action at the windows in a field like this, and it doesn’t hurt that she’s the only runner who enters as a last out turf winner around two turns. She exploded through the stretch winning her last in listed stakes company at 8.5f and gets to go a little further here third off the lay, where her trainer is 7 for 11 with three year old turf filles that are last out winners over the past three years. She shows ascending speed figures since last October, along with the best BRIS Late Pace Last Race figure in the field, which could come in handy considering the wealth of pace expected here. The pick. 4 JOURNEY HOME (9-2, 88 BRIS)-Made up 4 ½ lengths in the stretch two back in winning an 8.5f listed stakes. Deep closer threw up an even bigger number (99) when 8th in Grade 1 company at the longer 10f distance. She cuts back here and gets significant class relief for Graham Motion and should get plenty of pace to run at, but will need to run back to that effort, as daughter of War Front has been 8th in three of her last four outside of that one win. 5 DONTMESSWITHJOANNE (8-1, 91 BRIS) Lightly raced daughter of Pioneer of the Nile was a hard closing 5th behind two of these in the 8.5f Ta Wee, a race where the pace collapsed similarly to what we might see unfold here. She has never gone beyond 8f and should benefit from the added ground here as her Average BRIS Late Pace Figure is tired for the best in the field. She goes third off the lay, where trainer Brad Cox wins with 23% of his runners, and should be sitting on an improved effort. 6 SENSITIVE (12-1, 83 BRIS) Closer defeated lesser at 8f in her last but will need to take a step forward figure-wise. There are other closers here that close faster in the event of a pace collapse. 7 LOVELY BERNADETTE (7-2, 92 BRIS) Closed fastest of all when 3rd in her last at 8f, but that race fell apart up front and with three entered here that all scrambled within 1.25 of the win, we’re not sure why that translates to favoritism here. Heavily raced filly has only just recently switched to turf, showing a 1st and a 3rd in her two starts and never having gone this far before. Seems beatable at these odds. 8 PRINCESS LA QUINTA (20-1, 83 BRIS) Arlington-based daughter of Quality Road has spent time shifting between turf and polytrack, with her only two career wins two coming over the latter. She takes a step up in class having just broken her made three starts back and winning against optional claimers last out. 9 KATINKA (30-1, 82 BRIS) Early speed type would seem to be up against it stretching out here, having fallen back against lesser at 8f in her last two after leading through the half. 10 HAPPY MESA (5-1, 90 BRIS) Was completely off the board and beaten by a handful of these in her last at 8f but scored an impressive listed stakes win from off the pace in the race before that, posting a competitive figure. That race seems more like an outlier than the norm looking over her form lines, but if she runs back to it, she could be a force here with Flourent Geroux aboard. 11 CANNY (15-1, 88 BRIS) Pacesetter couldn’t quite hang on in her last effort, losing to today’s foe Journey Home by a neck at 8.5f after leading the whole way. She does have a win at the distance over allowance company in the race prior, the only runner in the field that can claim that, and could carry them a long way again with Julien Leparoux in the saddle for this well bred progeny of Big Brown. One wonders how sharp she will be though as she enters off a two month layoff, the longest in the field. 12 MO’S MVP (30-1, 75 BRIS) Her one career win in seven starts came over this turf course, so why not give it a shot? Then again, that win was her maiden in her 5th try, so this looks like a bit too much too soon. We’ll take a pass on trying to predict the race shape here and instead try to get through with just two that cover both scenarios in this short seven horse field. Closer ROCA ROJO hasn’t needed a strong pace to win from behind. Although she was closer to the crawling pace when winning her last, she won from well off the pace three back when they were only going :48.2 up front. She’s 3/3 at Belmont and boasts the highest speed figures in the field for 2017 (103 Beyer, 102 Brisnet). CELESTINE only knows one gear and figures to go straight to the lead. She turned in a career best effort in winning this race last year and is also a perfect 3/3 over the course. If SASSY LITTLE LILA doesn’t go with her to the inside, she could have it all her way up front. DICKINSON merits respect and figures to take money coming off an upset win over the highly regarded Lady Eli. We wonder if that wasn’t the better day to play her though, as Lady Eli was making her first start of the year and probably needed the race. She cuts back here to a distance that she may find a bit too sharp. Chad Brown sends out ANTONOE for her second start off the ship from France. She steps up in class off an allowance win last out but is Grade 3 placed across the pond and could offer value in this spot. There figures to be an ample enough pace in this seemingly wide open edition of the Met Mile to side with an off-the-pace type, and all signs point in one direction. AWESOME SLEW stretches out a furlong in his third off the lay for Mark Casse. He made up nearly four lengths in the stretch when just missing by a head at 7f in his last and the added distance figures to fit him like a glove in his spot. He has a solid bullet work on 6/2 to fall back on and has won from wide posts before; all systems go for the son of Awesome Again. SHARP AZTECA looms the horse to beat on paper off his 2016 form as well as his win in the Gulfstream Park Handicap at this distance in February, where he posted a field high 113 Brisnet figure and a 106 Beyer. He bested the top choice in that race by 4.5 lengths but enters here off a long layoff following a trip to Dubai, and with other pace signed on, this may be the time to look for the tables to turn. If we like the top pick, then it is tough to overlook the others that closed impressively in that race, TOM’S READY and SOLID WAGER, who both made up ground late to finish within a length of the winner as well. TOM’S READY appears particularly appealing, having won the 7f Woody Stephens over this course from off the pace a year ago. SOLID WAGER may have benefited a bit from the wet track that day and hasn’t yet won above the Grade 3 level, but has upside. DENMAN’S CALL upset the highly regarded Masochistic two back in the 7f Triple Bend, posting an eye-popping 104 Beyer. He faded to finish 7th in his last behind many of these but have may deserved a pass on the wet track; a return to his prior form puts himself squarely in the mix here. We’ll take a stand against the morning line favorite MOR SPIRIT, who ships in from the west coast following a career best 107 Beyer in a wire job at this distance over Grade 3 company. That was around two turns though, and he’s unlikely to have it as easy this time around with colts like SHARP AZTECA and the suddenly intriguing MOHAYMEN, who has posted two straight bullet works, gunning it early. RALLY CRY enters with strong figures on paper as well but has yet to win a stakes race, and we’d be more inclined to use ECONOMIC MODEL, who beat him head to head here a year ago, for the deeper exotics. Don’t look now, but there’s only one horse in the field that has posted a triple digit Beyer beyond 9f. SADLER’S JOY comes in third off the lay for Tom Albetrani in this spot and cuts back another furlong after winning the Grade 2 Pan American at 12f two back and finishing 3rd in the Grade 1 Man O’War at 11f last out. He should see plenty of pace to close into thanks to the presence of APPLICATOR combined with a couple of favorites that are prone to being on the lead. TIME TEST was installed as 5-1 on the morning line but figures to be half of that at best and the likely favorite by post time off his Euro form, which includes a Group 1 win at the distance. His Racing Post Rating of 124 simply towers over this field (next highest is 115, several tied at 114) so he definitely figures on class and is a must use in multi-race wagers. He was beaten as the heavy favorite in his first start off the ship last out, but he gets added distance and a drier course this time, and is in receipt of weight to boot as he runs second off the lay. Sticking with the Euros, POTEMKIN looms an intriguing longshot as he runs with first time Lasix here. He is a Group 1 winner in Italy at the distance as well as a Group 2 placed in France, and also receives weight with Joel Rosario on board. His Racing Post Rating of 114 puts him right there in the mix for a piece. BEACH PATROL, WORLD APPROVAL and DIVISIDERO are the top three choices on the morning line, having established themselves at the front of the American Turf division. The feeling here though is that all three are far better suited to the 9f distance. Of the three, we prefer BEACH PATROL, who does have a win at the distance, and who has been ultra-consistent, finishing no worse than 2nd in his last five starts. WORLD APPROVAL led here most of the way a year ago before fading to 3rd and then was off the board in the Arlington Million in his only other start at the distance, and DIVISIDERO has been 5th and 7th in his two 10f tries. Given that the winners of the Kentucky Derby and Preakness are passing on the final jewel of the Triple Crown, and that likely favorite Classic Empire was declared out earlier in the week, this year’s edition of the Belmont comes up a bit weak and wide open. That being the case, it is unfortunate that we’ve landed on the morning line favorite as the most likely winner, but we call them like we see them. IRISH WAR CRY seems to be on an alternating pattern of great races and disappointing ones, and is due for a bounce back after fading badly in the Kentucky Derby from a wide post. Fact is, he is still the only runner in the field to post a triple digit Beyer speed figure beyond 8.5f, and that combined with his tactical running style makes him the most likely winner in a race that often favors front runners. There isn’t any other real speed in here, as MEANTIME is a cheap front-running type who faded in the 8f Peter Pan and is bred to sprint. Being a son of Curlin, he’s likely to improve into his three year old season and this appears the right spot in the cycle. Remember, he easily dispatched eventual Preakness winner Cloud Computing in the Wood Memorial, so the quality is there when he shows up, it has just been a bit of an inconsistent proposition. Todd Pletcher has been successful in this race over the years and brings back two Derby runners here. TAPWRIT finished an above-expectations 6th in the Kentucky Derby and has been out working his one-eyed stablemate PATCH over the track. Sons of Tapit, once believed to be distance challenged, have won two of the last three editions of this race, but we will side with PATCH as the Pletcher colt the most upside from a pedigree standpoint, as his sire Union Rags and damsire AP Indy both won this race. PATCH, who had an extremely rough go of it when 14th in the Derby, is still very lightly raced making just his 5th career start, and is eligible to take a bit of a form leap here coming in fresh with John Velazquez aboard. He’ll certainly have no trouble with the distance, and the price should be right to see if he can find the speed to compete with these. Derby runner up LOOKIN AT LEE is the only runner to contest all three Triple Crown events, and while his deep closing style makes intuitive sense with the added distance here, that running style doesn’t always play well into races that don’t set up with much pace up front. He is sure to keep coming yet again but figures to miss the top spot. He is still our favorite of the closers though, as colts like SENIOR INVESTMENT and MULTIPLIER aren’t bred to run this far. J BOYS ECHO is another that defeated Cloud Computing but doesn’t seem to want to run at or beyond Classic distances, and Dubai shipper EPICHARIS has had soundness issues all week and is a play against at his 4-1 morning line. We could offer some lukewarm endorsement for GORMLEY underneath. He turned in an even enough effort when 9th in the Derby, and while he may not want to run quite this far and his speed figures have been in decline as distances have been increasing, may be able to grind his way onto the bottom of the superfecta. All told, we will give a decisive edge to the colts that competed on the first Saturday in May. Much was made of Chapman’s shortcomings in Game 7 and overuse in Game 6, but it’s easy to forget that neither would have happened in the first place if not for his performance in the first of his three elimination game experiences. He was able to escape trouble in the 7th and 8th innings with runners in scoring position, and then took his at bat in the bottom of the 8th before closing out the win in the 9th at home. Considering the lack of any room for error while holding onto life with a 3-2 lead, it was an all-time postseason performance. In a decisive Game 7 scenario, the Cubs came in riding momentum and needed a spark to keep it going. How about the first lead-off home run in Game 7 history? The Cubs needed it too, and every other run they scored, to force extra innings before eventually winning in the 10th. The Cub bats had gone cold and they were facing elimination in Game 5, trailing 1-0 in the bottom of the 4th. But then MVP Kris Bryant launched a solo shot to tie the game and sparked a three run inning that would be just enough to stay alive for Game 6. One of the best things about Game 7, which was probably the single greatest game of any sport I’ve ever witnessed live, was that every single Cub gave a meaningful contribution, and that every inch of it was needed for the win. After a wild pitch bounced off his mask and scored two runs to cut the lead in half the inning prior, David Ross hit an improbable solo shot off of the seemingly invincible Andrew Miller in his final game. Without it, the Cubs lose 6-5 in an absolute heartbreaker. There is nothing worse in all of sports than the fact that baseball’s first round of the playoffs is a five game series. It throws an element of unpredictability into the result that is completely illogical in a sport that plays a 162-game regular season, placing an uncommon amount of importance upon the first game of a series relative to other sports. In a pitcher’s duel for the ages, Baez was able to get ahold of one here and give the Cubs an important 1-0 win in a game that may otherwise have never ended. The Dodgers weren’t going to score on Kyle Hendricks, but it was important that the Cubs gave him a lead early against arguably the greatest pitcher of the young century in Clayton Kershaw. An Anthony Rizzo double and a fortunate outfield mistake set the stage for a 2 run first inning, which would be all the Cubs needed to clinch their first trip to the World Series since 1945, and send the home crowd into a Saturday night frenzy for the ages. This was an “icing on the cake” moment if ever there was one. Addison Russell, who had been cold as ice at the plate in the NLDS and NLCS, had begun to heat up in the World Series, but had no greater moment than this one, where he launched what was only the fifth grand slam in World Series history and gave the Cubs an insurmountable 7-0 lead basically assured a Game 7 for the ages. The first game of the NLCS was a roller coaster of emotions. The Cubs came into the series with their pitching rotation set up better than the Dodgers did by way of clinching their previous series in four games, so it was important not to waste the advantageous matchup of Jon Lester versus rookie Kenta Maeda. Lester did his job and the Cubs led 3-1 going to the 8th, but Adrian Gonzalez crushed our hearts with a game tying single off Aroldis Chapman. In the bottom half of the inning, Maddon had no choice but to pinch hit for Chapman with the bases loaded and two outs, leaving the Cubs vulnerable on the mound should they not score. Miguel Montero then launched a grand slam on an 0-2 slider to give the Cubs plenty of insurance. – Kris Bryant starts the inning with a leadoff single. – Anthony Rizzo delivers a fantastic at bat, drawing a walk after falling behind in the count, fouling off several pitches. – Ben Zobrist moves ahead in the count 3-1 against Sergio Romo, and then drives a double down the right field line, scoring Bryant and moving Rizzo to third. – Manager Joe Maddon outsmarts Bruce Bochy, pinch-hitting the left-handed Chris Coghlan for Addison Russell, who had been cold at the plate in the series. But Maddon likely never had any intention of batting Coghlan- he simply went with a lefty to get Bochy to make a pitching change to a a lefty. As soon as that happened, Maddon immediately burned Coghlan and instead pinch-hit with the red hot rookie righty Wilson Contreras, who promptly singled up the middle to tie the game in the biggest at bat of his life. – $180 million right fielder Jason Heyward had arguably been the only disappointment of the Cubs’ season, but he was sent to the plate to bunt with no outs and Contreras on first. The bunt he laid down was almost too horrendous to be real, but after forcing Contreras out at second, shortstop Brandon Crawford threw the ball away. This crucial error allowed Heyward to advance to second and put the winning run in scoring position, and also prevented him from being remembered as the worst bunter of all time. – Javy Baez delivered a hard hit single to score the go-ahead run, his second game-winning hit of the four game series. – Aroldis Chapman absolutely dominated the Giants, striking out the side in the bottom of the 9th, and the Cubs celebrated a series win in front of a stunned crowd in San Francisco. The stage was set. Two franchises with a combined 176 years since their last World Series Championship would play a single game to deliver one to a starved fanbase. The Cubs had control early, and even after a 5-1 lead was cut to 5-3, a David Ross provided some insurance. But the goat awoke in the bottom of the 8th. Four outs away from a World Championship and leading by three with Aroldis Chapman on the mound, the Indians were able to tie the game after a pinch hit double from Brandon Guyer and a soul-crushing two run bomb from Rajai Davis. The latter may have been the lowest point of my entire life as a sports fan. After the Cubs failed to score in the top of the 9th, panic set in, but Chapman was able to shut down the Indians and force extra innings. A rain delay immediately followed, because of course it did- Cubs fans were really going to have to earn it if they wanted to celebrate on this night. Jason Heyward delivered a now legendary locker room speech during the delay because he knew what we all knew: if the Cubs didn’t score in the top of the 10th, they were going to lose the World Series in heartbreaking fashion. Kyle Schwarber gave the Cubs life, starting off the inning with an important leadoff single to cap a 3-5 performance and cement an incredible comeback story. Pinch-runner Albert Almora was able to advance to second on a nifty piece of base running following a warning track fly out by Kris Bryant. In a puzzling move, manager Terry Francona opted to walk Anthony Rizzo to create a double play opportunity against the switch-hitting Ben Zobrist, who doubled in the go ahead run on a 1-2 count in an incredibly clutch piece of hitting. The move proved costly, as Rizzo scored what would be a crucial insurance run on the ensuing single by Miguel Montero. It wasn’t going to be that easy though, as even with a two run lead in the bottom of the inning, the Indians didn’t roll over easily. Carl Edwards Jr. was able to retire the first two batters, but a walk and a single later, the Indians had life, bringing the winning run to the plate with a man on first. Luckily for the Cubs, that hitter was Victor Martinez, not one the Indians’ greatest threats, and Mike Montgomery was able to force a softly hit ball down the third base line, which Kris Bryant easily corralled for the win. The curse was broken. We Are The Champions!